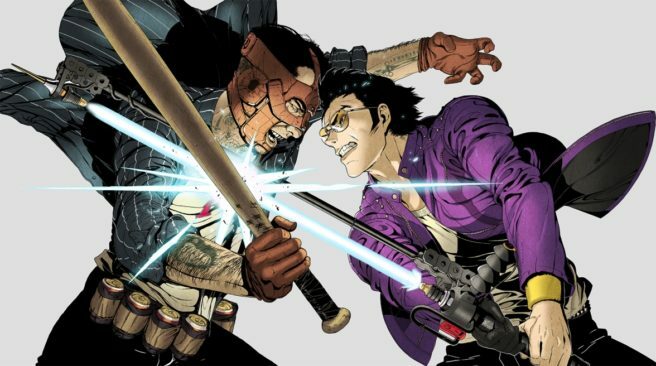 Many outlets have had a chance to speak with Travis Strikes Again: No More Heroes director Suda51. Famitsu was included, and was given an opportunity to learn more about the Switch game. In one of its issues, the Japanese magazine published a two-page interview with Suda51. During the interview, Suda51 provided a status update on development progress, some of the staffers working on the team, and background information for things like the Death Drive Mk-II. We have a full translation below. Famitsu: Suda-san appeared at the January Nintendo Switch Presentation 2017 and declared Travis’ “revival” there. First of all, please tell us the reason why did you decided to make a new game for Nintendo Switch. Suda51: I feel Travis Touchdown is one of the important characters that makes me want to create a sequel for, and thankfully he’s been loved by all players from both inside and outside the country. When wondering when the chance to make a further sequel would come, after the work on Let It Die calmed down, I learned about the Nintendo Switch. I instantly felt, “This console might have good compatibility with No More Heroes!” The past games also did well with the Wii Remote, and I feel the same appeal with Switch’s Joy-Con. Famitsu: And this game might look different than the past games. Suda51: Yes. I had an idea in my head on how to make a No More Heroes 3, but this game is not a numbered title. I’d like to have Travis challenge something different from ranked battles between killers as what had been depicted until now, and I also wanted to create a game with a middle-scale team of around 10-20 people, just like around the time when Grasshopper Manufacture was established, so I made this Travis Strikes Again project. I’m making an organizational structure where I can firmly get into the development scene and look at all the staff’s faces well. Famitsu: We’re looking forward to seeing Suda-san return as a director. So you’re creating this game while mingling with your middle-scale team in secret. Suda51: I’ve been meeting and talking with various indie game creators, but they have an even fewer number of people on their team, and have been making games with unique ideas not possibly born from major companies. Furthermore, the overall quality keeps getting better. Playing such titles give me much energy, and on the contrary, there are also many of them who said they like my titles such as Killer7 and No More Heroes. We also want to make a game with a challenging, new style, while keeping the roots – that looks like an indie spirit – intact. With holding such a thought, I set the title to be Travis Strikes Again. For the logo design, I asked Kondo Kojiro-san (representative of Black Belt Jones DC) just like in the first game. Suda51: Good question. This is a hand-made T-shirt with a parody of a famous phrase in England’s music industry placed on top of Unreal Engine’s logo. It reads “Unreal Engine is killing wasted resources”, so it’s really praising this awesome engine (laughs). Actually, other than the fact that this game uses Unreal Engine 4, the Death Drive Mk-II which appears in the game is also recommending an Unreal Engine prototype. Epic Games has also said they’re okay with this setting. Famitsu: What a lovely relationship between companies (laughs). Suda51: We’re making good use of assets like 3D models that were offered in the Unreal Engine marketplace, while arranging them for this game. Of course the idea for the game is unique to us, and there are also many assets that we created from scratch, but we’re planning for an optimization in development to show a scale and volume [made by a middle-scale team] that won’t lose against a major title. Being able to create such an organizational structure is also a theme of this project.